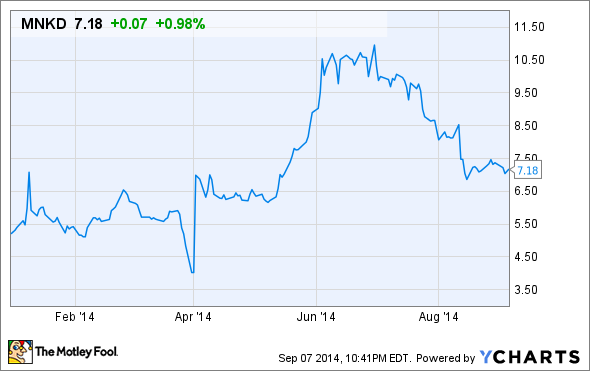 MannKind's stock has handily outperformed the S&P 500 in 2014. Find out what's sent its shares higher and whether or not it has more room to run. The SPDR S&P Biotech ETF has had a great year, advancing 22% since the year began. MannKind (NASDAQ:56400P706), however, has one-upped the broad-based biotech index with a 38% year-to-date gain of its own. What's caused MannKind's stock to ascend to the heavens? That's a question we'll answer today, as well as look at some of the catalysts that could move its stock going forward. The reason MannKind shares have shot higher in 2014 boils down to two important news events surrounding its lead drug Afrezza, an inhalable diabetes medication. First and foremost, the long-awaited approval in late June of Afrezza by the Food and Drug Administration put some serious pep in MannKind shareholders' step. As a reminder, Afrezza was actually rejected by the FDA back in 2011 with the FDA primarily raising concerns about its delivery device, the MedTone inhaler. However, MannKind went back to the drawing board and completed new clinical studies with a next-generation inhaler known as the Dreamboat, ultimately leading to an approval – and it's a big approval for a couple of reasons. To begin with, MannKind had no other approved products on pharmacy shelves, so Afrezza gives the company, when launched, its first genuine stream of revenue. It's also a product targeted at a wide swath of chronic disease sufferers. According to the Centers for Disease Control and Prevention there are 29.1 million people with diabetes in the U.S. Afrezza is particularly attractive as it's a diabetes therapy that can be used to treat both type 1 and type 2 diabetes patients. Also, don't discount the attractiveness of an inhalable medication versus the need to administer a shot. From the standpoint of convenience Afrezza could be a big winner. The other factor that's played to its advantage was the lucrative licensing deal MannKind signed with Sanofi (NASDAQ:SNY) last month. Under the terms of the deal MannKind will receive an upfront payment of $150 million, which helps stem any cash concerns investors may have had, and is eligible to receive an additional $775 million in milestone payments. To boot, Sanofi also agreed to advance its share of collaborative expenses up to $175 million. The end result is a 65% share of profits or losses for Sanofi and the remaining 35% going to MannKind. The two companies expect to begin selling Afrezza in the first quarter of 2015. It's truly been an exceptional year for MannKind, but that doesn't mean this hot biotech stock will motor higher without challenges. For example, the approval of Afrezza did come with a few exceptions. The FDA recommended that Afrezza not be prescribed to people who have chronic lung diseases such as asthma or chronic obstructive pulmonary disorder. Right off the bat this removes a large number of potential patients from Afrezza's target audience. There are also concerns about just how many people will opt to switch to an inhaler from injectable therapies. While an inhaler is certainly convenient, side effects like throat pain and/or irritation, as well as an expected higher price point than injectable treatments, could make consumers and physicians think twice before choosing Afrezza. Investors also have to consider MannKind's valuation compared to its profit potential. At the moment Wall Street has MannKind pegged to lose money through 2016, while delivering essentially breakeven results by 2017. Even with milestone payments from Sanofi this brings into question what premium is too high to pay for MannKind's stock. Admittedly, without having any tangible sales data on Afrezza it's really difficult to make a call as to where MannKind heads next. Although the product is clearly revolutionary and convenient, we've also seen our fair share of would-be blockbusters flop during their launch (e.g., anti-obesity drugs). The pricing of Afrezza is going to be a key component to its success, as will the duo's ability to get insurers to jump on board and cover the inhalable drug. I would suggest shareholders' best bet would be to stick to the sidelines and wait until mid- or late-2015 before making a bet in either direction as we'll have a better bead by then how well Afrezza is selling. It clearly has a lot of potential, but getting a drug approved by the FDA is only half the battle these days.